Removes free oils, non-permanent mechanically emulsified oils, and some settleable solids. Integral oil storage reservoirs are available. Hatches are provided for easy access into separator Sealed, vapor tight hatches are available. Lifting lugs or handles are provided on "THE CUBE®" and on the separator. The separated oil accumulates at the surface of the separation chamber where it displaces the water. As the oil layer increases, oil spills into an adjustable rotary pipe skimmer where it can flow by gravity to an optional integral oil storage reservoir or to remote storage tank. Flow enters the inlet chamber where it is dispersed through a non-clog diffuser across the width & depth of the media pack. Larger solids drop out here into the sludge chamber before entering the media pack. The Sludge Chamber is located directly beneath the separation chamber and provides adequate volume for settled solids. The sides of the sludge chamber are sloped 45° to insure easy and complete removal of the solids. *This option available on the "CE" series only. 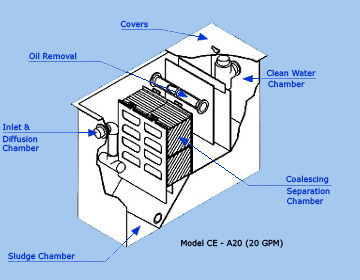 The Clean water leaving "THE CUBE®" passes under an oil retention baffle and into the effluent or clean water chamber. From there, the clean water passes over a weir which maintains the liquid level in the separator. The clean water flows by gravity through a "T" pipe outlet or effluent pumps can be provided. The "T" pipe provides an excellent site for sampling the effluent. The separation chamber is filled with "THE CUBE®" pack. The ribbed plates are arranged vertical in direction of flow with a series of 5/16" holes spaced 1/2" apart. As the plates are stacked and overlapped, it will cause the flow to zigzag around 90° corners throughout the pack, causing resistance to flow, collection of oil droplets 2-microns and larger which enhances coalescence. The coalesced oil has the least restricted path to exit the waste stream and rises to the surface. Solids entering "THE CUBE®" encounter a 90° angle of inclination created by "THE CUBE®" which assists solids settling. The solids slide down the vertical holes to the next rib gathering mass and velocity as they near the bottom of "THE CUBE®" and drop into the sludge chamber. For more information on THE CUBE® Oil / Water Separator, simply complete our HOH Quick Response Form.